Kurkuri Bhindi? 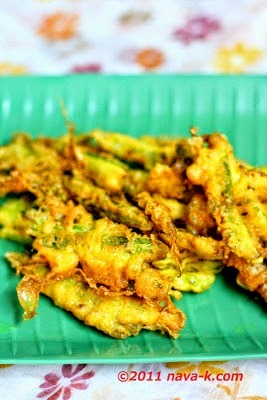 Crispy fried sliced bendi/okra after dunking into a batter made from coconut milk, flour and turmeric powder. And fried goodies on the whole (Fried Potato Rolls) is? Tell me about frying and crunching in almost immediately (Prawn Fritters)? Sounds really mouth watering right? I know. Kurkuri Bhindi. Your snack (Fried Lotus Roots), or an accompanied for your rice meal (Chilli Aloo & Tapioca Stir Fry). Add all ingredients for the batter into a bowl. Whisk together for a thin runny batter by streaming in water bit by bit. Drain over kitchen towel before serving. Thanks for your sweet words of condolence. We had a good time celebrating my aunt's life. I have used corn flour for batter before, but it sure did not turn out like yours. Perhaps it is the coconut milk?! Anyhow these do look extra crispy and tasty, I am going to keep your flavorful batter recipe so I can enjoy. Well done! They are so crispy and my husband loves these. I can see how your family ate them so quickly. Wow, fried okra looks gorgeous! yummy. Oh gosh I live okra and this looks amazing! I love okra in almost any preparation, and fried is delicious. Great recipe. OMG sounds delicious nava!! i love okra so much!! That looks amazing--I like okra, but have never had it fried. 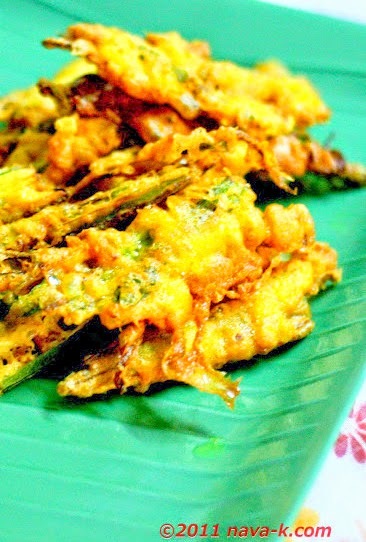 I have to admit,I never had okra,but i do like crispy foods,maybe i will like it :) looks yummy even I never taste of okra !! Nava, Okra is one of my favourite vegetable. I can eat it in any for. I bet fried one will taste the best. My goodness these look delicious. Okra has been one of my favorite foods since childhood. Oh, how I wish it were spring so I could put out my okra seedlings. Hi Nava! Okra is very popular where I live - and yours looks delicious! I LOVE the batter you used...no wonder everyone kept pinching a taste! I love okra, especially when it's fried! This looks excellent! Thank you so much to all for the support and amazing comments. You people are so great and again thanks.